Bluetooth technology connects your hearing aids to your smartphone or other electronic device, enabling you to your favorite media directly into your ear. Almost all of our models offer moisture and dust resistant casing to ensure your hearing aids are protected from the rigours of daily wear. These help the wearer aim their hearing aid to the sounds they actually want to hear, like towards the person in front of them. They’re an excellent aid to one-on-one conversations. Telecoils enable you to stream audio from PA systems directly into your hearing aid though an electromagnetic connection. Telecoil systems are usually found in libraries, government buildings, and public venues, and are a very useful feature to have if your frequent public places often. 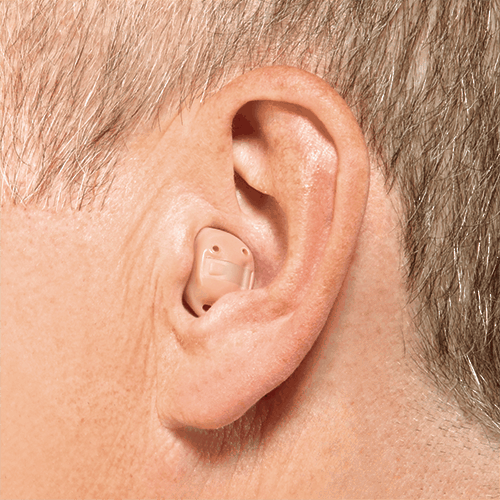 The smallest and most discreet option are the Invisible-in-canal hearing aids (IIC). These are fit completely inside the ear canal and so nobody around you will know you are wearing them. They fit these looking for an extremely discreet hearing aid, and have only mild to moderate hearing loss. 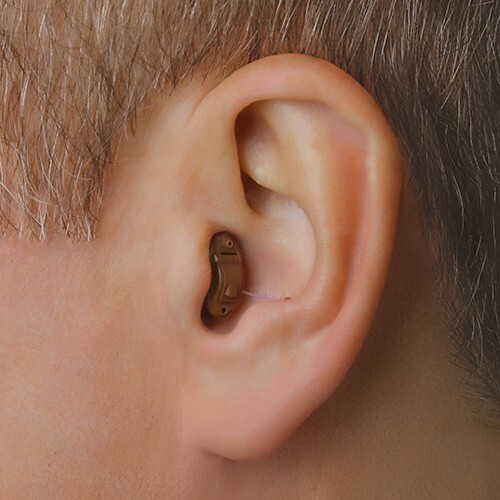 Placed completely in the ear canal, these hearing aids are almost imperceptible to others around you, unless the person is looking directly into your ear from a close distance. They are molded specifically to fit your ear canal. These are similar to BTE hearing aids, but the key difference is the receiver is worn in the canal. This makes them a more discreet option than the BTE devices, but again, they are may be a little uncomfortable for those with eyeglasses. These are a type which are inserted into the ear canal. Usually custom made, they are a discreet option so are appealing for those who don’t want their hearing loss to be completely apparent. They are best for those with moderate hearing loss, as they don’t come with a directional microphone. 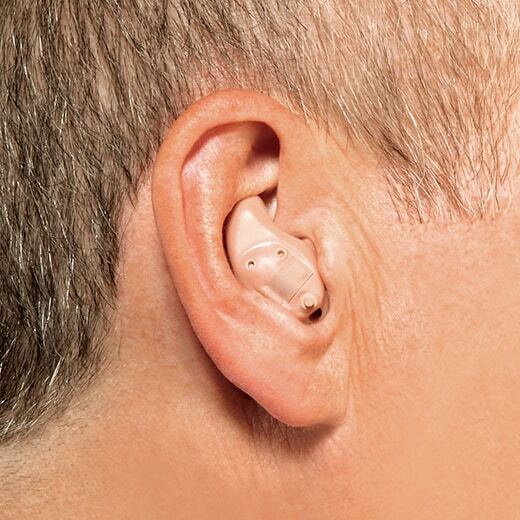 The ITE hearing aids are a shell-like design which is worn inside the outer portion of the ear. 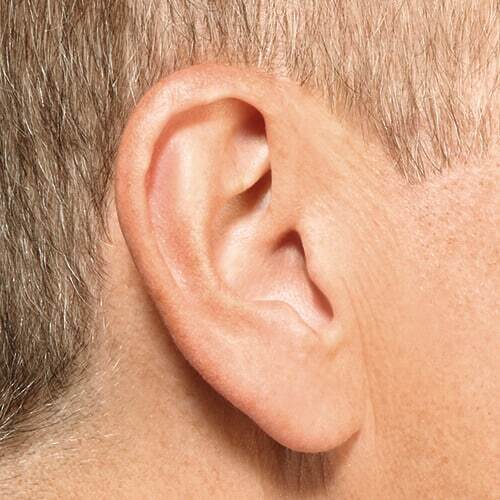 They are formed using a mold of your ear and sit directly on the surface of the ear. As such they are suitable for those who wear glasses. They are easy to insert in the morning, but there are more options out there for those who need an extra layer of discretion. 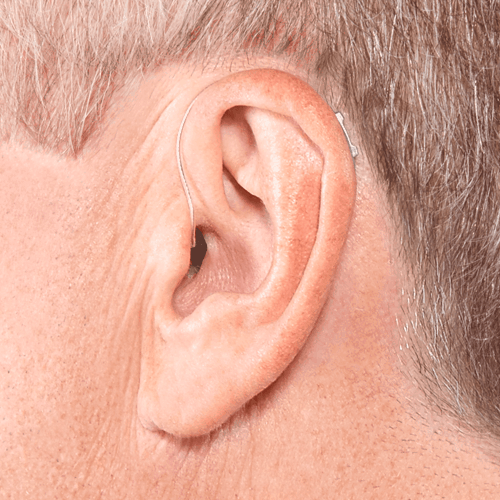 These hearing aids come in two parts. One part is the plastic casing which contains the processing power and drapes behind your ear. This part connects to a component that sits within your ear canal, delivering amplified sound. 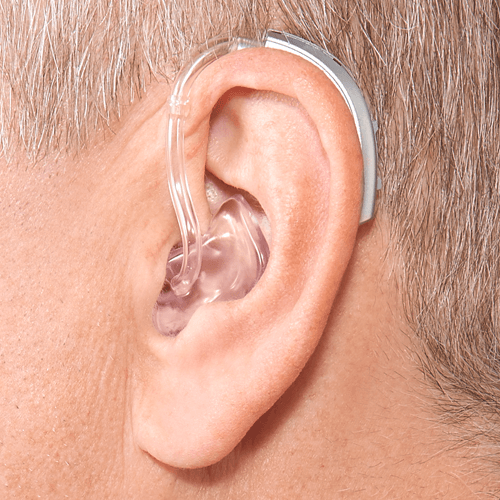 They are great for a range of hearing loss levels from mild to profound, and are especially suit to those who find it tough to handle small controls due to dexterity issues. Unfortunately, they may be a challenge to wear for those who wear eyeglasses. BTE hearing aids are an excellent choice for children in particular, as they are flexible with growth. There are several models by our manufacturers that run on rechargeable batteries or have recharging systems. These are great as you don’t have to worry about replacing batteries when you are out and about. The hearing aids usually come with a charging station in which you can place your devices into overnight. With a single overnight charge, rechargeable hearing aids last between 16 and 20 hours. 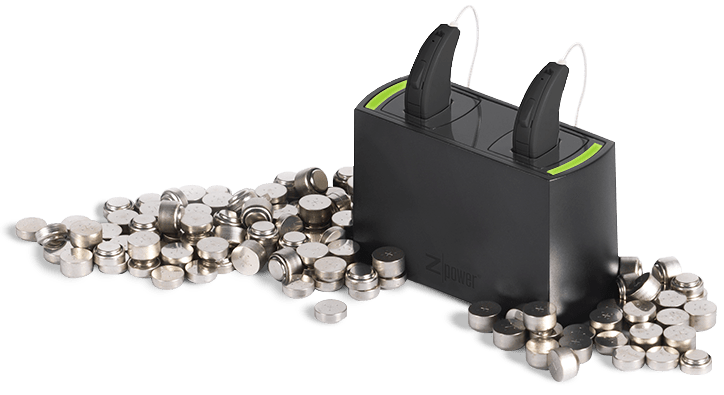 With one of our rechargeable models, you’ll save time and money, and will buy fewer batteries, which is great news for the environment. Even with the best hearing aids, sometimes you need a little help when talking on the phone. One device we offer which has revolutionized phone conversations is the CaptionCall phone. Do you find it difficult to talk on the phone with loved ones? The CaptionCall phone is a revolutionary device aimed at people who could benefit from captions when talking on the phone. You use them all the time for watching movies, why not take advantage of them for phone calls? 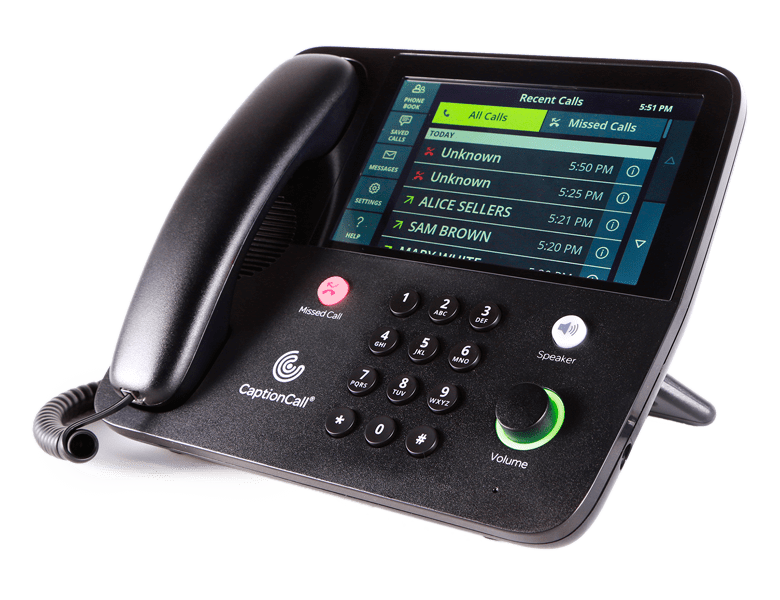 The CaptionCall phone provides quick and smooth-scrolling live captions on a large screen, as well as amplification to give you that edge in phone conversations. *There is no cost for qualified individuals to participate in this federal program. We accept a variety of insurance plans. Please contact us to inquire if we accept yours.